Fresh strawberries seem to taste sweeter when they come from your own garden. Part of growing your own strawberries is fertilizing the plants so they stay strong and productive. Treat the strawberries in the spring before the plants flower to make the most of this year’s growth. Depending on your preference, a liquid or granule fertilizer can be used, just be sure to keep the fertilizer from coming into contact with the foliage of your plants. Clear away any debris, mulch or dead leaves from the ground. Use a cultivator to lightly scour the surface as you draw the material away from the plant. Strawberry roots grow close to the surface, so don’t dig down further than 1/2 inch with the cultivator. Spread a granule fertilizer over the surface as a side dressing, following the packaging instruction for dosage. Work the fertilizer into the upper layer of soil around the plants with the cultivator. Do not hit the roots or place fertilizer directly against the plant itself. Apply a water-soluble fertilizer, if you prefer, in place of a granule one. Follow the directions on the package for the amount of water and fertilizer. Pour the mixture around the base of your plant, keeping the fertilizer off the leaves. 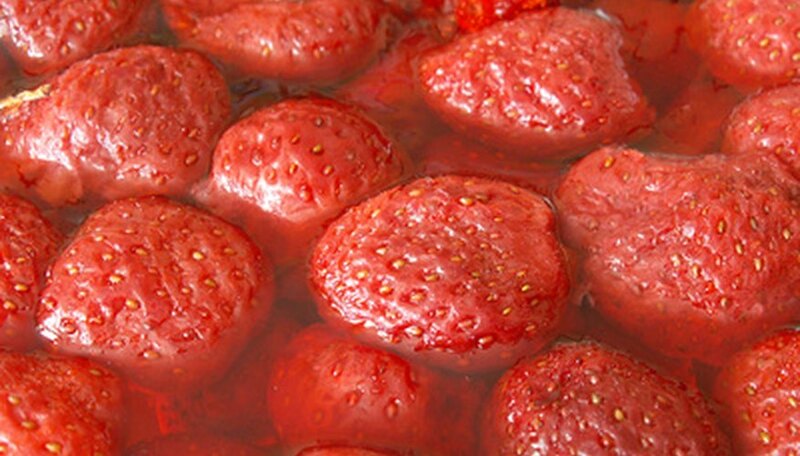 Repeat the fertilization process in the fall after you have harvested your strawberries. Avoid fertilizing your strawberries at any time between flowering and fruiting. Using a 10-20-10 fertilizer will produce bigger berries; however, it can lead to softer skin on the berries and potentially cause rot.